Guo Tao takes on the world in Don Quixote. The Skinny: A decent performance from lead actor Guo Tao can't overcome an average story and unimaginative direction. Too bad, because setting Don Quixote in ancient China seemed like a pretty damn smart concept. Not as bad as they say online, but still not all that great. by Kozo: The concept was inspired, but the actual movie? Less so. 2010 Filmko Pictures release Don Quixote transplants Miguel de Cervantes classic Spanish literature to ancient China, and at first glance, it looks like a good idea. Guo Tao (Crazy Stone) plays the Chinese Don Quixote, a chronic dreamer whose love of fiction leads him to pursue a life of fantasy. Thinking that he’s meant to be a knight errant (or “wandering knight”), Quixote takes to road, seeking adventure, damsels in distress and, above all, justice. Of course he’s totally off his rocker. Early on, Quixote comes across a peasant girl (Karena Lam, in what amounts to a wasted role for the talented actress) being kidnapped by a band of less-than-righteous soldiers, and Quixote immediate decides that she’s “Princess Fragrante,” even though her name is really Rosie. Quixote’s first duel versus the gang ends in a surprising win, though it’s luck rather than skill that gives him the “W.” Following that, Quixote recruits stalwart companion Sancho Panza (Wang Geng) before pursuing the kidnappers, leading to a grand adventure that subverts the world of jiang hu both cleverly and surprisingly. One would hope, anyway. In the early going, genre subversion seems to be the goal of director Agan (Big Movie, Two Stupid Eggs), with Quixote used as a means of demonstrating the inherent ridiculousness of the martial arts movie. 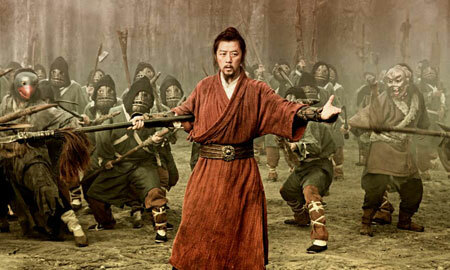 Wandering kung-fu masters are usually madmen, and honor is something that can be used to hoodwink the dimwitted. Don Quixote earns fame, but it’s mostly through luck and a confluence of selfish politics, unsubstantiated rumor and Quixote’s endearing but self-aggrandizing ego. The potential for satire here is huge, and the faux-fantasy setting puts Don Quixote on track to become a China version of The Princess Bride, i.e. partially funny, partially sweet and overall pretty smart. Unfortunately, Agan is not a strong enough director to pull off that feat. He’s got the right template and the right actor (Guo Tao is delightfully dense in the lead role) to pull off a workable satire, but he can’t bring the story and characters to the proper places. The plot progresses flatly, without the crescendos needed to get the audience involved. Most of the time the satire is far too subdued, with occasional moments where it seems to attempt earnest emotion. Characters flip-flop egregiously; for example, Sancho Panza converts from a doubter to a believer in Quixote almost instantly, even though not much happens that warrants his change. Worst of all, the film never develops properly. It just limps along, turning revealing story points into flat exposition. image credit: Filmko Entertainment Ltd.